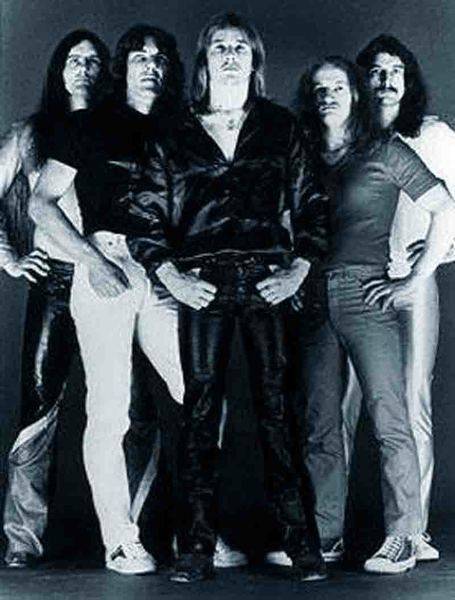 Melodic NWOBHM band 'Dark Star' were perhaps best known for their 'hit' "Lady of Mars", which was featured on the 'Metal for Muthas' Vol. 2 compilation album as well as featuring on their self-titled debut album "Dark Star", which was released in 1981 through 'Avatar Records'. The band during it's early years was made up of Mark Oseland on bass, Steve Atkins on drums, Bob Key and Dave Harrison on guitar and finally Rik Staines on vocals. Over their career the band have released a demo album in 1980, two singles and two full length studio albums between 1980 and 1987.After limited success the band broke up in 1985 while writing a second album. However in 1987 members Staines, Harrison and Key regrouped and finished the work they'd started on the album with the help of Dave Keates and Simon Atkins. The result was the album 'Real To Reel' which was released through FM Revolver in 1987. However the band decided to call it a day shortly after the release of this album and that was to be the end of the career of another NWOBHM metal band who perhaps never hit the form they were capable of. After the split up, all the members except singer Staines went on to form a Blues band called 'Poker Alice'. While Staines managed former Heavy Records band 'Marshall Law' for a short period of time in the late 1980's. 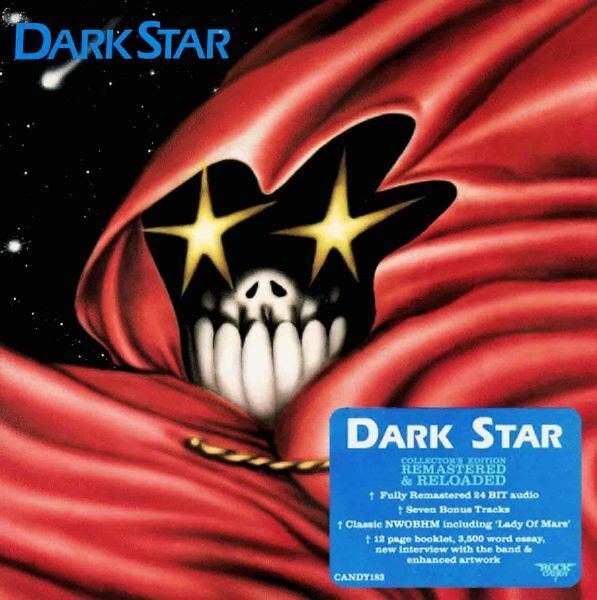 One of those LP's that marked my musical youth was the debut of forgotten NWOBHM rangers DARK STAR. Their song "Lady Of Mars" is a cult classic, and precisely this single - after being included in the legendary EMI new band's compilations ‘Metal For Muthas Volume II’ album (remember these?) - Dark Star secured a record deal with the newly formed Avatar label.The one and only (self titled) album by Dark Star has been remastered, re-issued and given the full treatment by those wonderful people at Rock Candy Records.Dark Star wasn't your typical NWOBHM, in fact, listening to it now, it does not sound too heavy. The strength of this band for me was always in their sense of melody, and while some songs rock hard, there's many elaborated melodies and even progressive moments.With their twin lead guitar approach, Dark Star obviously took some cues from Thin Lizzy and Praying Mantis, but they had a more epic and majestic aspect to their songwriting that brings to mind Saracen and earlier Magnum as well. Also classic UFO comes to mind, and it is possible to feel for some Blue Öyster Cultish weirdness too, if only for a teaser.Dark Star lends a lot in sound and even appearance to late '70s hard rockers and give an impression to have one leg in the past-gone decade and other striving for opening the '80s.Obviously "Lady Of Mars" is the highlight of this album, including all the ingredients of the era: great riff, guitar work that gets in your head, soaring chorus, great lead breaks and a chugging undercurrent that causing thousands of heads to bang whilst playing air guitar. Ah, to be young in the late ‘70s/early ‘80s.Still, the LP has some other shining moments like leadoff rocker "Kaptain America" (echoing the Cold War drama), the lengthy mid-pace rocker "Backstreet Killer" with a nice stomping riff and a head-nodding chorus, and the riffage treat of "Rock Bringer".There are flashes of twin guitar brilliance in the latter for Bob Key and Dave Harrison, and as always the melodic vocals of Rik Staines are a cut above the norm. "Lousia" is more melodious akin Thin Lizzy, as the jumping "Lady Love". "The Musician" sets apart Dark Star from the NWOBHM crowd with its acoustic progressive skeleton, while the ethereal, bluesy atmospheric closer "Green Peace" has a mysterious aura.Unlike most of the NWOBHM’s penchant for a raucous cacophony of fast riffs, Dark Star’s aspirations were far broader in scope harnessing a penchant for melody and muscle. "Dark Star" shows the more melodic, mid-paced and calmer side of the British scene at the time.With this Rock Candy reissue, we get the definitive Dark Star experience. 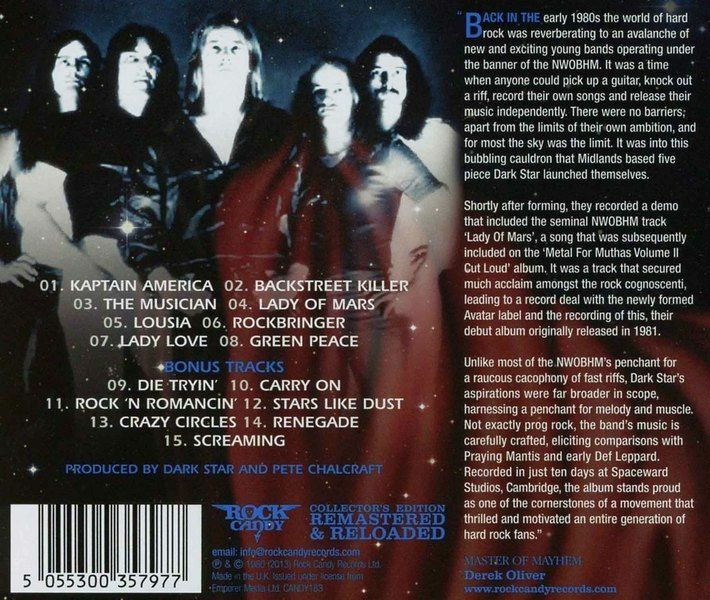 This is the first official CD release ever, featuring the original 1981 album remastered, a hefty seven bonus tracks - including the band’s full 5-song '79 demo, the b-side "Rock n’ Romancin´" and a live song called "Screaming" - as well as liner notes loaded with vintage photos and a band history.It's a fantastic reissue all-around of an album which has stood the test of time and still sounds great today.